A full-liquid diet is one in which everything you consume is liquid or liquid-like. It's a step up from clear-liquid diets, in which everything you "eat" must be a translucent liquid such as juice, but it does not contain solid food or most pureed foods. Full-liquid diets incorporate more substantial liquids and provide more adequate nutrition than clear-liquid diets, but you must be careful if you have to follow one for a long time. They are typically used for medical reasons, such as when recovering from gastric surgery or when dealing with a jaw disorder, and they must be supervised by a doctor. Any solid food that you have to chew is not allowed on a full-liquid diet. This is one of the basic rules of a full-liquid diet. According to MedlinePlus, the food you can have is anything that is "normally liquid and foods that turn to liquid when they are at room temperature, like ice cream. It also includes strained creamy soups, tea, juice, Jell-O, milkshakes, pudding, and Popsicles." This presents an issue in terms of getting non-dairy protein because meat, chicken, turkey, pork and fish, and any other meat product, are prohibited during full-liquid diets. Broth is allowed. 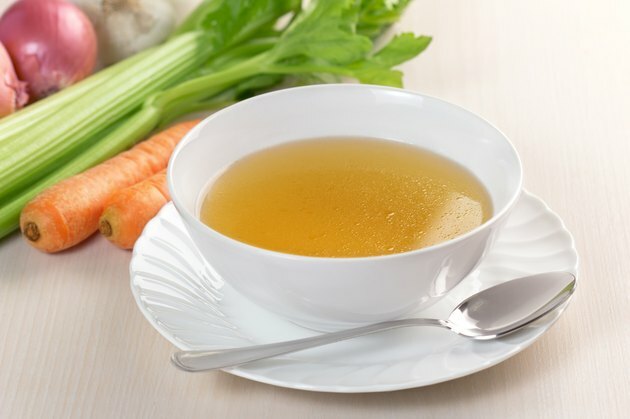 Depending on your condition, your doctor might OK strained meat broth that contains very small particles of meat, or baby food containing strained meat. Bean and nut products are not allowed, either. Many foods normally allowed on full-liquid diets become unallowable if they contain chunks of solid food. Yogurt, soup, gelatin and ice cream are all normally acceptable foods, but they cannot contain additions like seeds, nuts, fruit chunks, chocolate chips, cookies or chopped vegetables. These are solids--the surrounding liquid does not make them somehow less solid in terms of the full-liquid diet's requirements. Some full-liquid diets allow soft, liquidy foods, such as hot cereals like grits, but they do not go so far as to allow mashed foods. MedlinePlus makes a point of noting specifically that mashed potatoes, mashed avocados and other mashed foods do not count as liquid. It is possible in some cases--again, if allowed by the supervising doctors and dietitians--to have pureed potatoes as part of a soup dish. Applesauce and baby-food strained fruits are sometimes allowed. Full-liquid diets are customized to fit whatever your condition is. The National Cancer Institute says you might have to avoid all alcohol if you are taking certain medications, and that you might have to stick to decaffeinated coffee and tea. Full-liquid diets assigned to patients recovering from gastric bypass surgery may eliminate sugary foods, specifying sugar-free versions instead. What Types of Food Are Considered a Clear Liquid Diet?